Bengalis love to cook and eat spicy dishes. The Bengali recipes never fail to impress someone. Kosha Murgir Mangsho is one of the favourite recipes of Bengalis. Not only Bengalis but most of the non-vegetarian would love to lick their fingers after taking this velvety gravy with the juicy pieces of meat. This is a perfect dish to have with Steamed Rice or Biryani, Luchi, Paratha or Roti. 1. Clean the Chicken and put it on the strainer to remove all the water. 2. Now, after 20-30 mins, take large bowl and add yogurt, ginger-garlic paste, turmeric powder, cumin powder, red chilli powder and chicken and mix everything properly. Keep it aside for at least 2 hours. You can also keep this in refrigerator for at least 1 hour. 3. Heat oil in a large kadai and add bay leaf, cardamoms, cinnamon, cloves and methi seeds and fry it for few seconds till nice fragrance come. 4. Now, add onions, salt and sugar and sauté it till onion becomes soft and golden brown in colour. 5. Now, add chopped tomato and sauté it for few minutes. Add the marinated chicken and mix everything. Lower the flame and cover with lid. Cook the chicken till soft and tender. After 10-15 mins open the lid and stir it. Check whether the chicken cooked or not. 6. If the chicken cooked, then higher the flame and fry the chicken till oil separates fro masala. Now, add 1 cup of warm water and cook it for another 15-20 mins. 7. 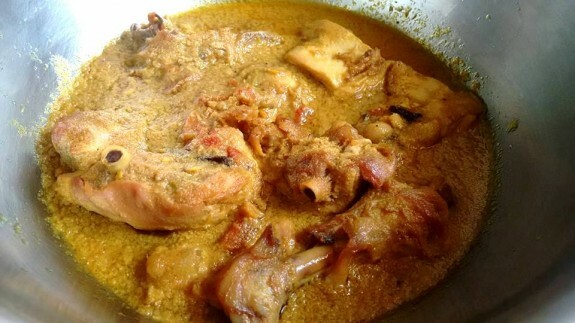 When the chicken properly cooked and gravy becomes thick, add garam masala powder and ghee on it. 8. Your Kosha Murgir Mangsho in Bengali style is ready to serve.